Between June 2016 and February 2017 the Marlborough Area Neighbourhood Plan (MANP) Steering Committee organised five public consultation events to identify the main issues of concern to the general public. The majority of issues raised during the consultation events will be addressed as part of the Local Plan remit. Certain issues that were raised are outside of the remit of the Local Plan and will be brought to the attention of the appropriate organisations. The following notes summarise the results for the domains of Housing and Countryside & Recreation. The primary concern expressed in this domain, with 20% of the total responses, was the lack of affordable housing for local people. Of these, 41% of the comments specifically stated that affordable homes should be made available for young people. Other points raised were that affordable homes should be available for older residents and families and that affordable housing should be both for purchase and for rent. The second major issue raised in this domain, after affordable housing, was that of G. P. facilities. There were 70 comments (16% of the total) which ranged from the perceived need for a second G.P. practise in Marlborough or an additional Health Centre to a walk-in centre and specialised facilities for older people. Some comments cited a need for better parking facilities at the existing surgery. The third ranked issue with 59 comments (14% of the total) related to local schools with comments covering the need to build a new Preshute School, concerns about the over subscribing of St John’s and their admissions policy that was perceived to favour children from out of the area over children from some local schools. The fourth most important issue raised in this domain concerns infrastructure. Of the total responses, 13% expressed concerns about the perceived lack of planning for the development of roads, parking, local shops, play areas and G.P. facilities. The public feels that this has resulted in inadequate parking on new housing estates, congestion on major roads, lack of parking within the town centre and facilities that are overcrowded and inefficient. Of the total respondents, 11% stated that there should be no more developments that are dedicated for over 55’s. Within a number of these responses it was also stated there should be no additional care and nursing homes. The need for more variety in the range of sizes of homes was expressed in 8% of the comments, including 1 and 2 bedroomed flats and smaller family sized homes. Comments about the Youth Centre and Skate Park made up 5% of the total in this domain. Concerns were raised that, if the facility in the Recreation Ground were to close with the skateboard park, this would leave the young people with no activities. Some comments suggested retaining the Youth Centre as a wider community facility. A lack of social housing featured in 4% of the total comments where the need was expressed to provide smaller homes for the local young, older people and families from poorer sectors of the community. There was concern about losing young people from the community, in both Marlborough and the village parishes, because of the lack of affordable housing (in the wider sense of the definition) for younger, local people. Ten respondents (0.5% of the total) suggested that Savernake Hospital should be used to provide more medical services for the local community including facilities for out of hours doctors, G.P. services and NHS dentistry. One comment suggested that a park and ride facility should be introduced to address the problem of parking at Savernake Hospital. The most popular category in this domain was the Saving of Green Spaces with 24% of the total comments (38 comments). 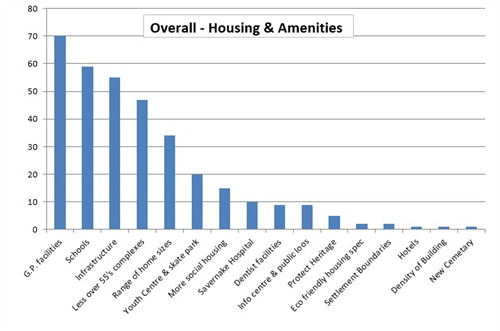 Of these almost half specifically referred to not building on green spaces. Other comments covered a range of concerns including wanting green spaces preserved, the maintenance and improvement of existing green spaces, increasing green spaces and no more building on the Common. The third ranked issue with 15% of the total (24 comments) related to local Areas of Outstanding Nature Beauty. The main concern expressed was that AONBs needed to be protected and not used for housing. Safeguarding the Natural environment, (9% of the total) and River Kennet and Water Meadows, (8% of the total) attracted similar comments pertaining to the preservation and protection of the river and its associated water meadows and the River Kennet where concerns were expressed about flooding, droughts, protecting the water supply and waste water management. Stonebridge Meadow and Cooper’s Meadow were specifically mentioned. Some respondents felt that the work of the charity ARK (Action for the River Kennet) had greatly improved the rare chalk stream (River Kennet) and the adjoining water meadows. Generally, the comments emphasized that this specific natural environment is greatly valued by the community. 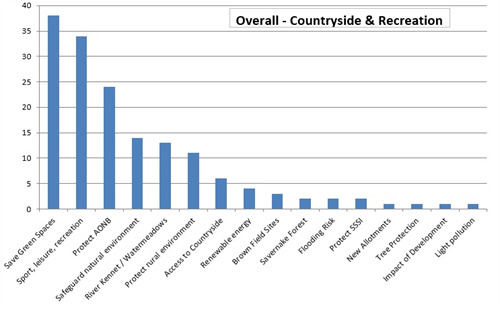 Protecting the rural environment made up 7% of the total comments in this domain where AONBs, SSSIs and Savernake Forest were specifically mentioned as rural environments that should protected. Although respondents generally felt the countryside around the MANP area is valued for its beauty, a number of the comments stated there should be support for some development and diversification for farmers to ensure their rural enterprises remain viable. This category polled 4% of the total comments which record the perceived need to improve access to the countryside (both access for local people and to improve the drive for increased tourism) through maintaining rights of ways, the opening of new footpaths and cycle ways and through an increase in accessible open spaces. References to building on brown field sites were contained within 2% of the total comments where respondents expressed the view that brown field sites should be developed first (before green field sites), that brown field sites should be optimised and especially the use of redundant farm buildings for residential and commercial developments.